Dorsal hump reduction or Increasing the height of nose. Correction of nasal tips that are upturned, drooping, bulbous/boxy. Correction of breathing problems in deviated septum. Reduction of nasal width at its bridge or in position of nostrils. 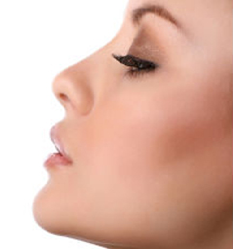 Healthy individuals with a fully developed nose are suitable candidates for this surgery. The nose is completely developed by the age of 16 in females and 18 in males. Surgery done on a not fully grown nose may change the results of the surgery conducted when the nose matures. It is important to have positive outlook and realistic expectations of the surgery. During the consultation, Dr. Ree Age would examine the nasal and facial structure and skin envelope.An analysis of the nasal profile and facial balance is done.Be prepared to discuss your medical condition, drug allergies,any surgical procedures done before, current medications, herbal supplements, tobacco/ drug use. She might also ask you to bring pictures of yourself when you were younger. Post examination, the doctor would talk about options available , discuss your expectations and achievable output. Blood tests will be recommended followed by a anesthetic check. Rhinoplasty is often done using local anesthesia if the correction is minor or a general anesthesia for total rhinoplasty. It is an day-care procedure but at times may require an overnight observation and stay in the hospital. The surgery time may vary depending on the output desired. Rhinoplasty is performed either using a closed procedure, where incisions are hidden inside the nose, or an open procedure, where an incision is made across the columella, the narrow strip of tissue that separates the nostrils.Skin is gently raised allowing access to the underlying bone and cartilage. An overly large nose may be reduced by removing bone or cartilage. Sometimes surgery of the nose may require the addition of cartilage grafts.These cartilage are taken from septum, and occasionally from ear or ribs. If the septum is deviated, it can be straightened and projections inside the nose reduced to improve breathing. Skin is re-draped over the nose and incisions are closed. A splint is placed to conform to the new shape.A nasal pack may be inserted in your nostrils for 24 hours to control bleeding. The patient’s pulse and cardiac rhythm are continuously monitored during surgery. The patient is monitored till the anesthesia effect is gone. 2 Pillows to keep the head elevated for 1 week after surgery. No strenuous activities for four weeks. Medicines as prescribed by the surgeon. The splint is taken off after two week of surgery.You will be advised to wear a night splint for another 2 weeks after total rhinoplasty. There will be bruises and swelling around the eyes and nose for about two weeks.You will be advised to start on a liquid diet initially, followed by soft diet for the next 2 weeks.Keep your nostrils clean with earbuds soaked in saline and apply antiseptic ointment. Exercise and swimming can be resumed after four weeks. Work may be resumed after 4-5 days. Bleeding Nasal blockage Skin infection and irritation Injury and wounds on the nasal septum. Changes in skin sensation. Nasal asymmetry, prolonged tip edema. Implant infection, extrusion, displacement. Possibility of revised surgery. Rhinoplasty results are permanent. However, if the result did not meet the expectations, a revision surgery may be required.